My hometown Tilburg is getting better and better! 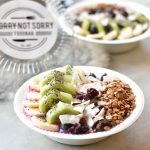 As of last Saturday Poké and More opened its doors in Tilburg. At Poké and More you can get delicious poké bowls. Poke is originally a raw fish salad served as an appetizer from Hawaii, but nowadays poké bowls are sold in all kinds of varieties and are often a lunch or dinner dish. 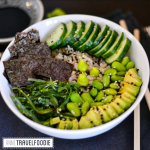 Most poké bowl restaurants only serve their bowls with white rice and raw fish, a bit like my sushi bowl recipe (although that one is vegan). 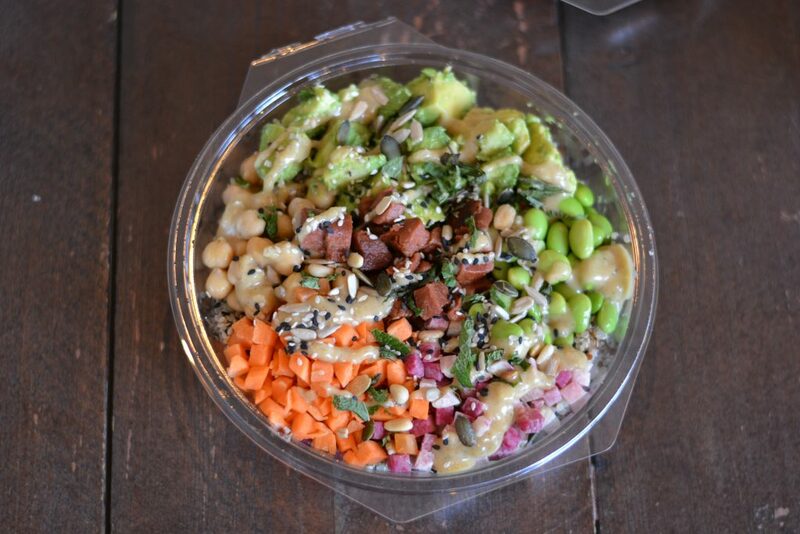 Poké and More in Tilburg has many options, including healthier and vegetarian ingredients. You can swap your sushi rice by pearl couscous, quinoa or courgetti. And no need to order fish, they have vegetarian bacon and vegetarian gamba’s from the Vegetarian Butcher. 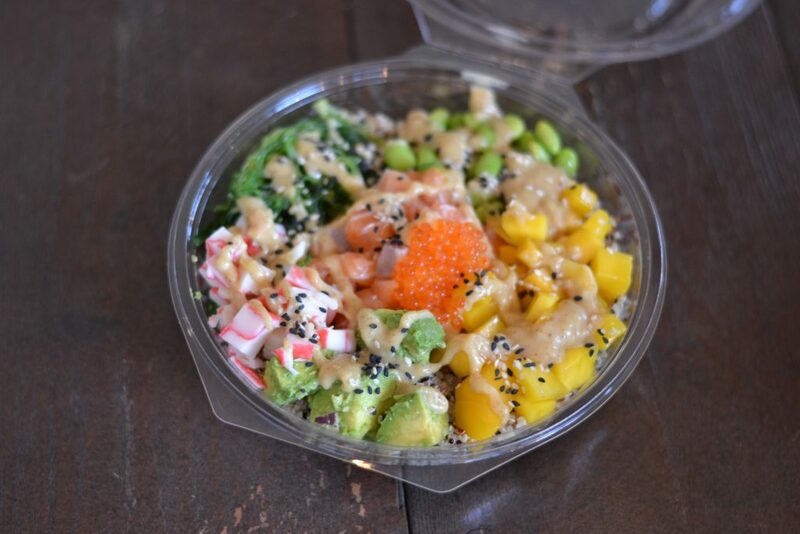 You can create your own poké bowl or go for one of the 8 poké specials that are created by Poké and More. They have two vegetarian and 4 meat free combinations. One vegetarian poké bowl is with pearl couscous, vegetarian bacon, tomato, dried apricots, feta, mint and a yogurt-mint dressing. The other one is called Nuts on Veggies and is made with courgetti (courgette noodles), vegetarian gamba’s, radish, chickpeas and cashews. You can also create your own poké bowl with the many ingredients they have. 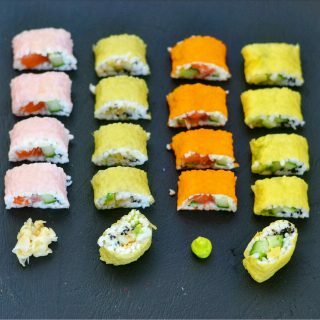 You first choose your size (small or medium) and your base (sushi rice, couscous, quinoa or courgetti). Step 2 is choosing your protein like fresh salmon or the vegetarian options. 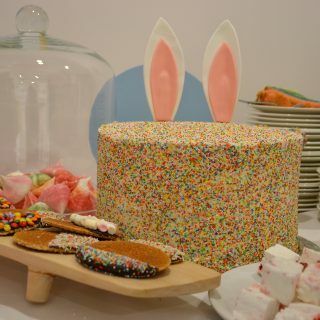 Then you choose your ingredients, they have 18 in total so there’s something for everyone. They have ingredients like corn, carrot, mango, pineapple, and wakame. Step 4 is choosing one of the 8 dressings and after that you can also choose toppings like chili flakes, fried onions or raisins. I went for a vegetarian poké bowl that I created myself. 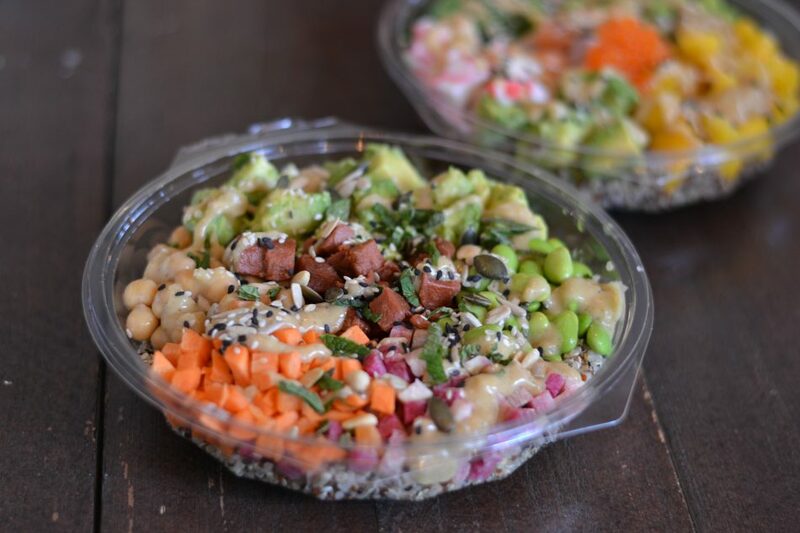 It’s made with quinoa, vegetarian bacon, red radishes, carrot, avocado and chickpeas. I went for the ras-el-hanout dressing and topped it with mint and pumpkinseeds. 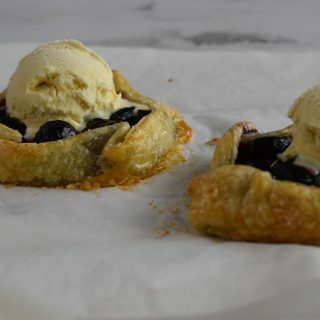 Check all my favorite food spots in Tilburg on this page. 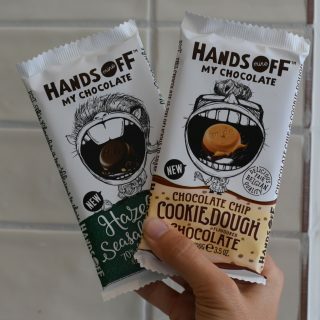 Win the 2 new chocolate flavors from Hands Off ..